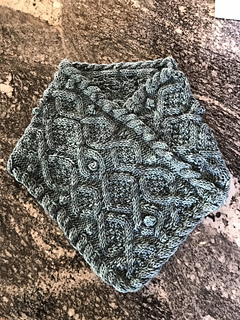 Irish Cowboy is a neck-warmer featuring a cable-and-bobble pattern on a background of reverse stockinette and moss stitch, bordered by twist cables. It is knit flat, then joined by seaming the cast-off end to the side adjacent to the cast-on end. This creates a shape that effectively keeps the neck warm while wearing a v-necked jacket. The cable trim is extended on one side and seamed to the cast-on edge to complete the finish. Yarn: Knit Picks Capra DK (50g/123 yds, 112m, 85% Merino, 15% Cashmere), 2 balls. Errata: Under directions for set up of Trim Extension on WS, it should read K1, p8 rather than K8, p1. This has been corrected on most recent version.